My original fourteen thru-hikers are down to six. I started to track fourteen brave explorers of the Appalachian Trail who began their adventures in either January or February. Three started in January while only one remains – Hard Knocks who started his adventure on January 31 (Genesis and Zen Master had to leave the trail after giving their best effort). The other eleven began their quests in February and of these eleven only five are still active on the trail: RTK (Return To Katahdin), Sour Kraut, Chip, Next Step, and Pigweed. 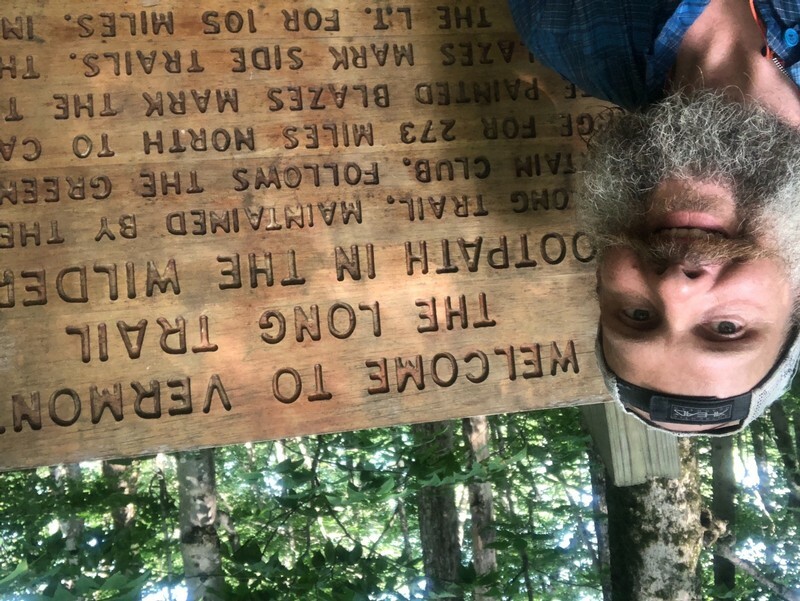 Vagabond Jack made a brief second attempted, but after ten days and 82 miles through some of Massachusetts and Vermont, a medical condition ended his thru-hike hopes. 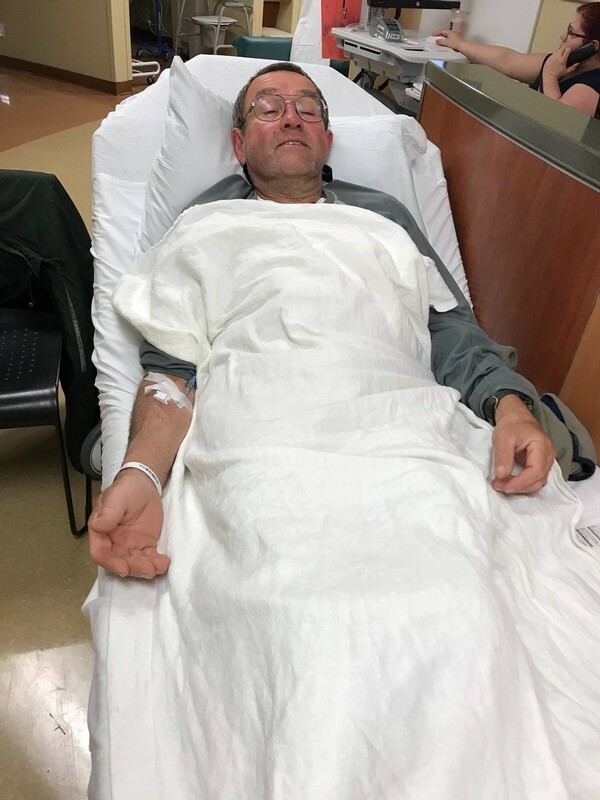 I have not heard from Hard Knocks since July 4th when he was camped at Garfield Ridge Shelter about 10 miles north of Franconia Notch in the White Mountains of New Hampshire. That is quite a long time of silence and in the past, I have assumed that a hiker has left the trail after three weeks of no entries. But I will continue to monitor Hard Knocks because he was such a strong and determined hiker plus he has entered the Whites where cell phone coverage makes it quite difficult to update an online journal. On July 4th he was about 1825 miles along the trail. RTK’s last entry was July 17th. He typically posts on Thursdays and communicates a week in arrears. He was in Manchester Center, Vermont enjoying a zero-day while being safe and dry in the midst of a thunderstorm. 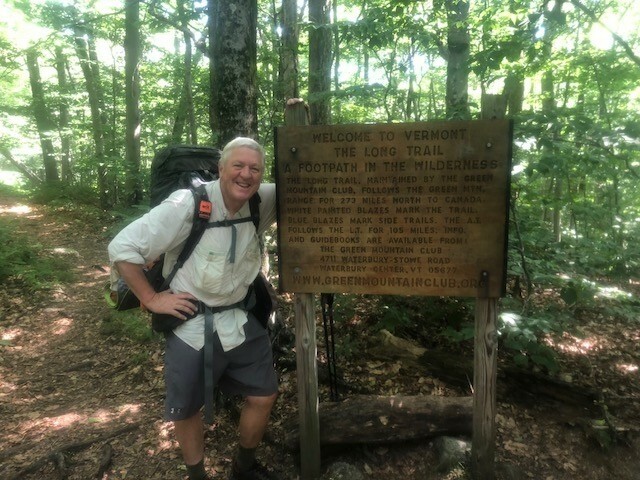 RTK has been hiking with Hawk, a hiker following the Long Trail, which junctions the Appalachian Trail through the state of Vermont. Sour Kraut’s last photo was posted on July 20th indicating that he has made it safely to Mt Mooslilauke in New Hampshire about 1795 miles from Springer Mountain, Georgia. Mt Mooslilauke has incredible views and introduces the hiker to the White Mountains ahead. It only has an elevation of 4800 feet but the climb to the summit involves a descent of 3750 feet in six miles. Next Step began his trek of the Appalachian Trail with his wife (trail name Which Way) on February 24th. The hiked together until May 29 when Which Way needed to “back” away from the trail when a nagging back injury demanded some rehab. After 156 days on the trail, Which Way has reached the final state of the hike – Maine. He has logged in about 1,910 miles with about 290 tough miles to reach Katahdin. 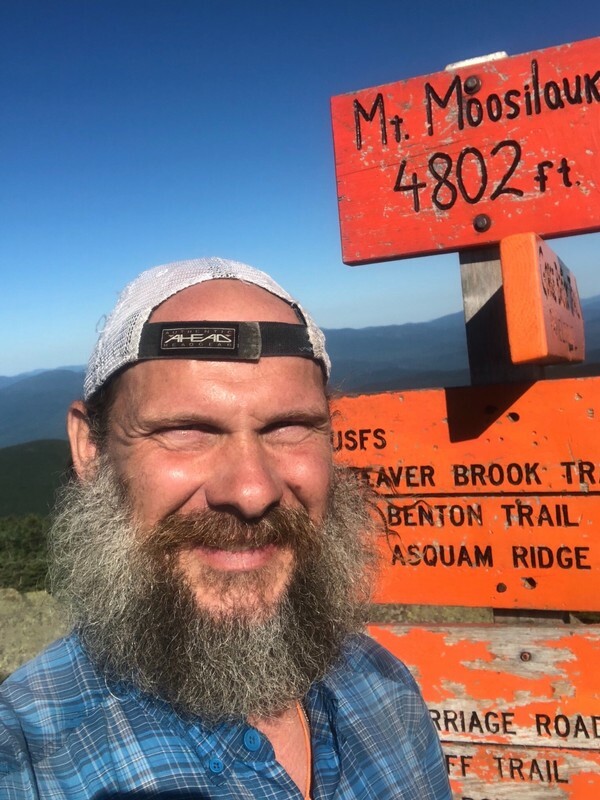 On July 29 he was staying at Full Goose Shelter just short of Mahoosuc Notch and Arm tomorrow (the most difficult 2.5 miles along the trail). I found the Arm just a little easier than the Notch, which was brutal. The last hiker still on the trail is Pigweed. On June 15th, Pigweed took a 25-day rest from the trail with his wife to the beach. He left the trail near Buena Vista, Virginia, then on July 11th, re-entered the trail in Maine, climbing Mount Katahdin and heading south. 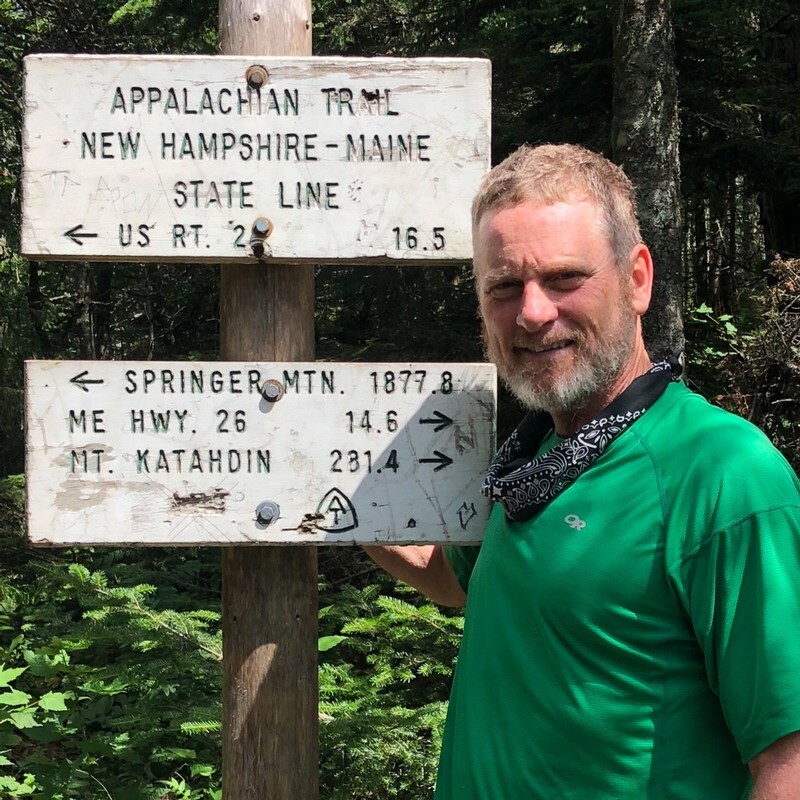 In the last twenty days he has hiked SOBO (southbound) for 188.2 miles and on July 30 was enjoying a zero-day in Stratton, Maine where he is celebrating his first 1,000 miles. He is significantly behind the pace of the other hikers and I hope that the flip-flop (stopping in Virginia and traveling north to Maine) will allow him to finish before the weather turns too cold to continue. I have been waiting for a current update from each of the six thru-hikers of the Appalachian Trail that I am following via trailjournals.com before making this post. This does not seem to be coming together well, so let me share what I know and catch you up on those who are posting regularly. Pigweed has been off trail since June 14, taking some time with his wife at the beach. He posted from Buena Vista, Virginia (about AT mile 803), on June 14 and projected his return after the 4th of July weekend. 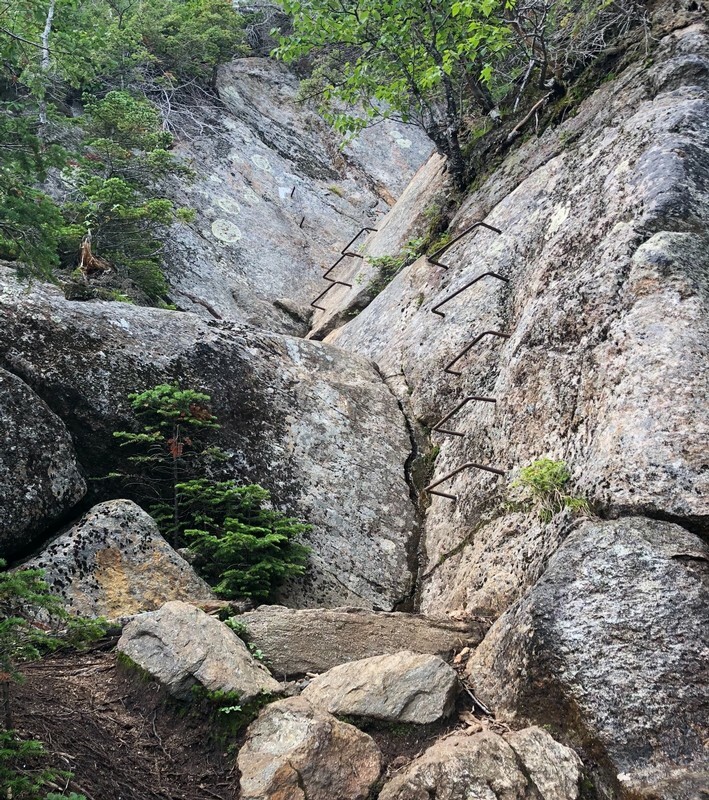 He was considering a flip-flop experience by driving up north, completing the trail in Maine, and then finishing the section that he skipped. RTK (Return to Katahdin) posts a week in arrears and his last update was on June 30 (13 days ago). Bruce Matson (RTK) was at mile-1,456. 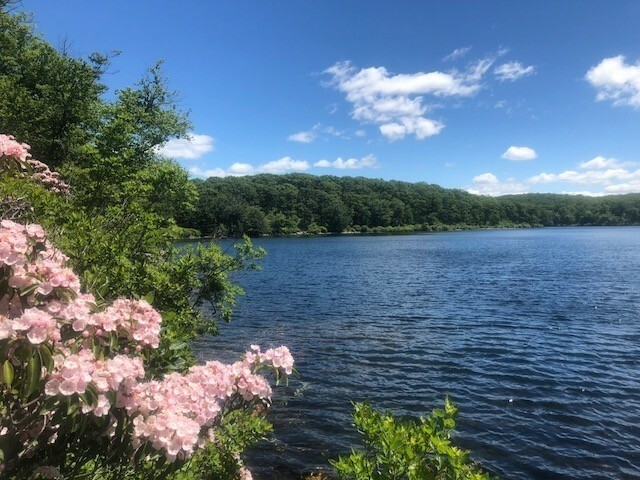 Earlier that week, he spent three zero days at Bear Mountain Bridge Hotel in Fort Montgomery, New York, before hiking north toward the Connecticut border. He crossed over the border on June 29, spent the night close to Bull’s Bridge and then traveled to a family reunion off trail. Hard Knocks last posted on July 4th. He checked in while he was at Franconia Notch, New Hampshire (mile 1,823), sharing that cell phone coverage was extremely poor and that he would update soon. That was ten days ago and without an update. Entering the White Mountains, he does encounter extreme terrain which is infamous for cell phone blackouts. I would not be surprised to hear that Hard Knocks is hiking in Maine – looking forward to hearing from this strong hiker. Sour Kraut last photo update was ten days ago (July 4th) picturing himself at the Vermont border and about mile 1,593. The number of hikers has increased back up to seven with the return of Vagabond Jack to the trail. 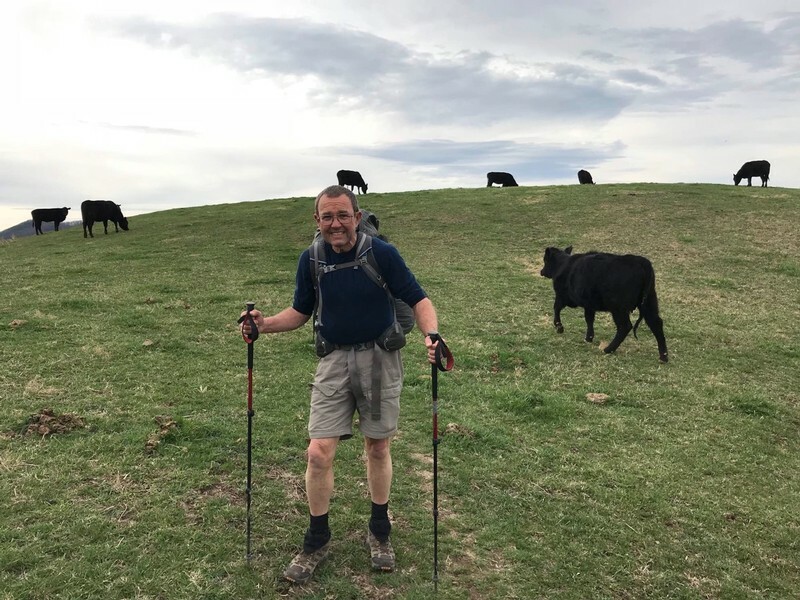 Jack left the trail back quest for medical reasons at the end of April while he was hiking close to Newport, Virginia (mile – 671.5). 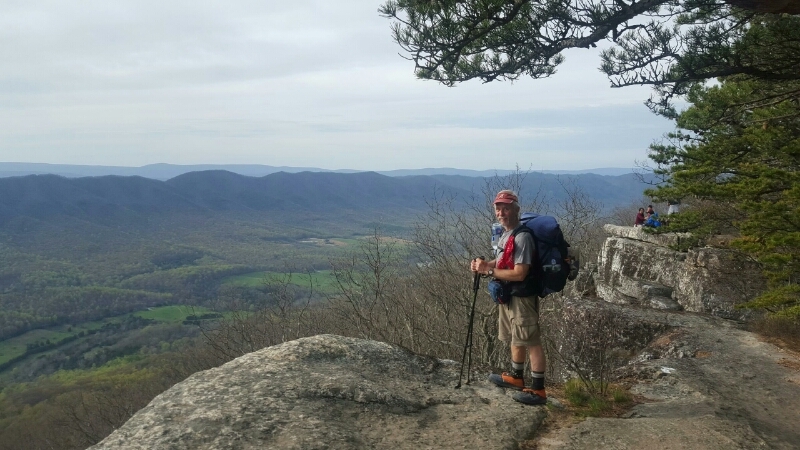 He has taken a long break and now is excited about continuing his a thru-hike of the Appalachian Trail. 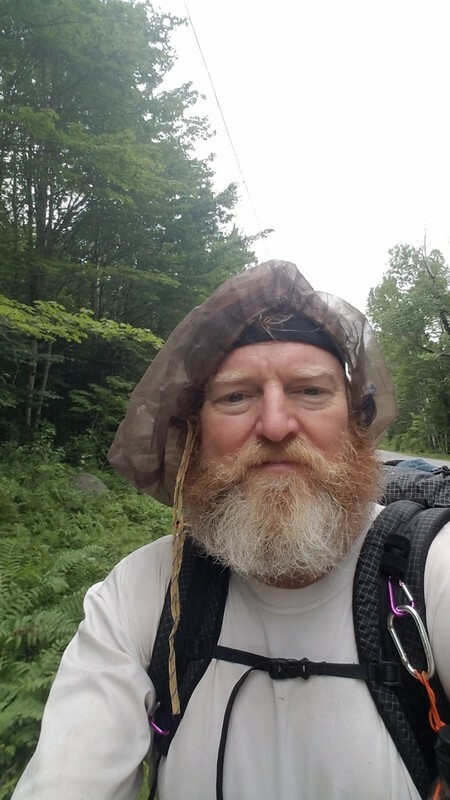 He has re-entered the trail close to Dalton, Massachusetts (mile 1565), hiked 9 miles to Cheshire, MA, and plans to hike north to Maine and then complete his hike southbound from Massachusetts to Virginia. Chip has done a very nice job updating his journal almost every day of his recent experience. On July 13 he was in New Jersey, his home state, enjoying a brief relieve from the rocks of Pennsylvania. The rocks will reappear very soon, but his walk around Sunfish Pond soothed his feet from the brutal terrain of the Keystone State. Chip was traveled over 1,300 miles and I hope he will make it to the summit before the winter snows force him from his goal. Next Step continues to hike solo. 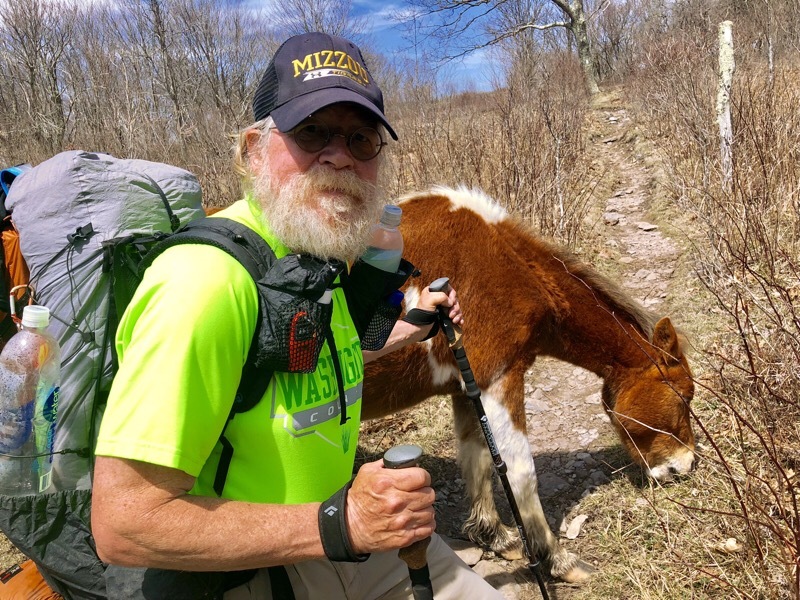 His wife, Which Way, who took a hiatus from the hike close to Harpers Ferry at the end of May, rejoined him in Great Barrington, MA, on June 28. She tested her back injury for a couple of days and realized that she was not able to fulfill her dream at this time. Next Step has decided to continue without her and continues to make strong hikes to the great mountain in Maine. 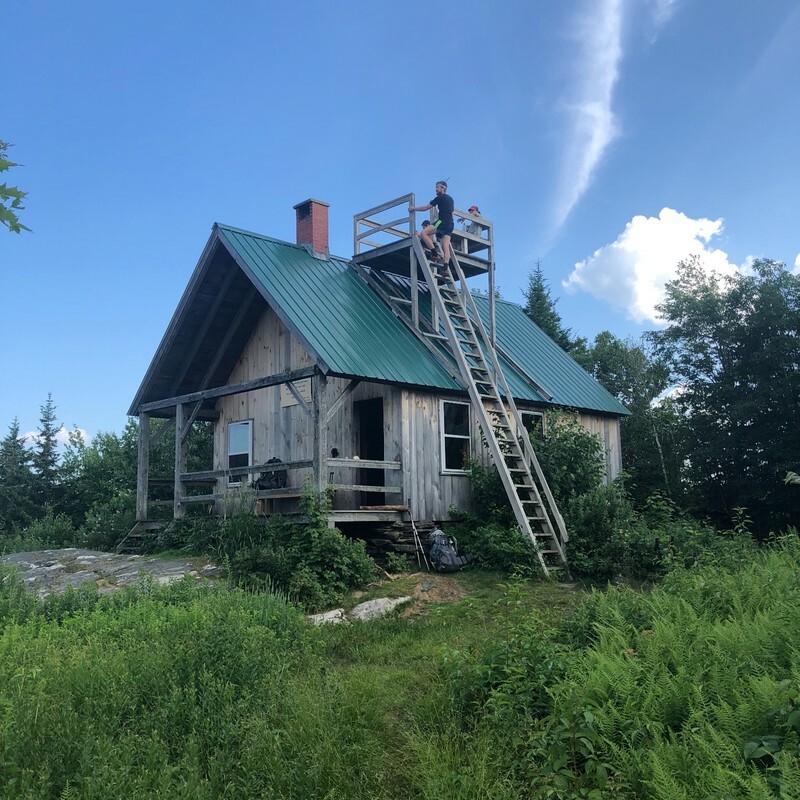 He has traversed 1,715 miles of the AT and enjoyed a night at The Lookout (a cabin with an observation tower) in Vermont (about 30 miles from the New Hampshire border). The Appalachian Trail Conservancy initiated a 14-State Challenge to anyone who wanted to experience a little bit of the AT in each of the 14 states from Georgia to Maine (Georgia, North Carolina, Tennessee, Virginia, West Virginia, Maryland, Pennsylvania, New Jersey, New York, Connecticut, Massachusetts, Vermont, New Hampshire, and Maine). It is done on an honors system with time frame involved. Rocky and I decided we would walk right in and begin our trek this summer. We decided to move NOBO (northbound) by starting in Georgia and touching the first four states along the trail. Day Seven (Saturday, June 23) completed our first leg of the challenge as we visited Grayson Highlands State Park in southern Virginia. The state of Virginia comprises some 550 miles of the AT making it the longest state of the 14. It is so long that some thru-hiker get the “Virginia Blues” longing for the next state to arrive. There is so much to see in this wonderful state, that Rocky and I will most likely return to Virginia when we begin part two of our journey. When I thru-hiked the trail in 2014 I divided the state up into three “states” (each comprising about 183 miles) to create smaller hiking goals. 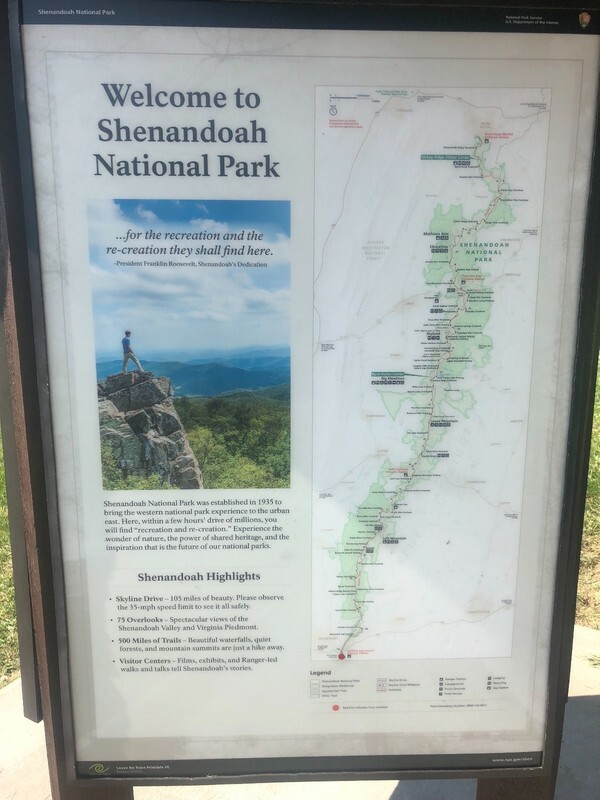 I call the first “state” was Southern Virginia, followed by Middle-Earth Virginia, and concluding with Doah Virginia (in honor of the Shenandoah National Park and a great fellow-hiker, Princess Doah). All of our hiking on this first leg was in Southern Virginia, so Rocky and I want to touch Middle Earth and Doah on our next adventure. All of that aside, Grayson Highlands was fantastic! The ponies greeted us, the rocks cried out to us, the rain showered its blessing on us, the wind blew almost blew our hats off, and the clouds almost engulfed us during our incredible hike through the rocky terrain. As Rocky and I drove the 30 minutes from our motel in Marion, Virginia, the rain began to sprinkle on the windshield. By the time we reached the state park, it was raining a constant gentle rain. Pulling into a parking place, Rocky did not hesitate – she was out of the car and wanting to get her trekking poles out of the trunk. The initial 20-minutes was a little wet and a little cold, but the weather began to cooperate, the rain subsided, and the hike became quite comfortable. The cloud cover and the wind (which was rather intense at times) continued all morning giving us a fantastic cover from the sun’s heat. Most of the highlands is open without tree cover, so the sun can make a hike rather sweltering. We encountered several wild ponies along the way. 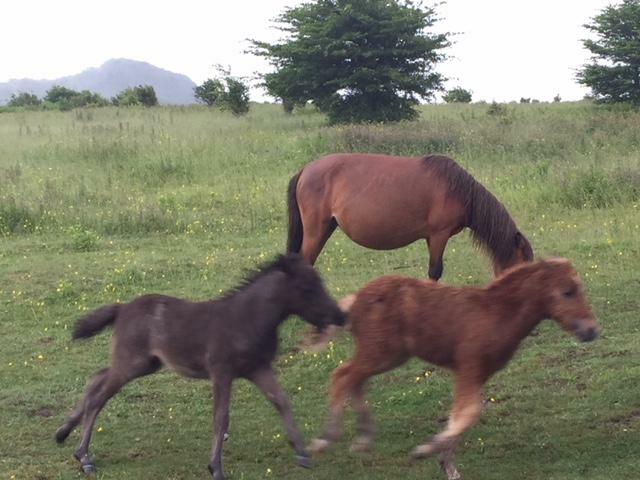 There were a number of foals that were full of life and had fun with each other testing out their legs with zestful games of tag. Rocky and I watched and laughed as they played totally ignoring the two retired folks with walking sticks. 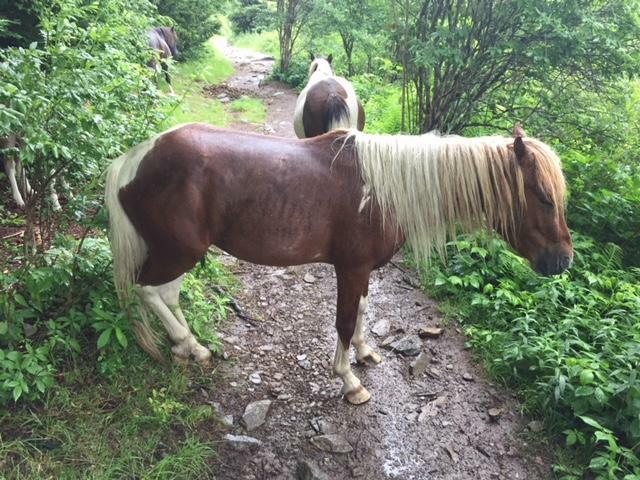 As we moved north, we encountered a few ponies standing right on the path. Rocky used her Mimi skills and “lovingly pushed” the horses off the trail so that we could pass on by. The elevation change through the highlands is less than 600 feet, but the rocky terrain made the hike a nice challenge for us. Add to the terrain some blustery winds and some wet rocks, and the trail presented some adventure that translated into some special memories for us. Rocky was such a trooper and we laughed, marveled, prayed, and enjoyed the entire trek without one word of complaint or negativity. She is such a special hiking buddy! 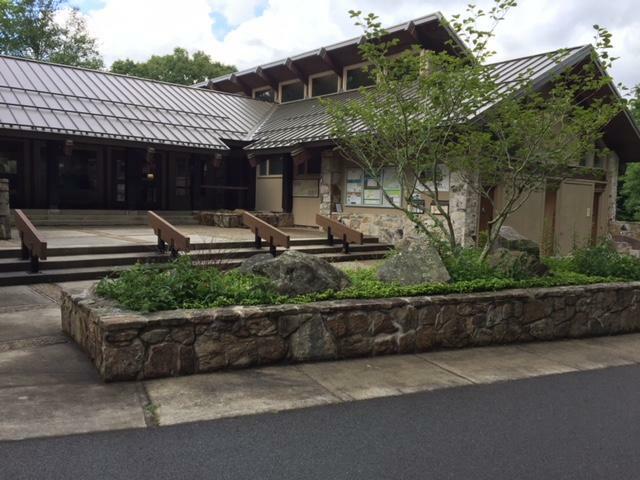 After completing the trail, we returned to our car and drove to the Virgil J. Cox Visitor Center. Rocky and I got our AT Passports stamped at the center and then enjoyed a drive through the country roads back toward Marion. Sunday is a travel day as we end this portion of the challenge and return to the comfort of home. The adventure was remarkable, but there is no place like home. As we reflected on the last week, Rocky and I also projected the journey ahead of us as we begin to plan for stage two of the challenge. I have heard that the Shenandoah Valley is glorious in the fall. Despite the threat of rain, Rocky and I left Johnson City, TN in route to a trailhead at Cross Mountain on TN 91 near Shady Valley. I was a little nervous about parking because Google Maps did not show any distinctive places, but we found ample parking right at the trailhead. I selected this spot because it was totally in Tennessee and it meandered through wide open pastureland. The clouds gave a nice cover from the sun but withheld any raindrops from falling on our heads (There are some great lyrics for a good country song in there somewhere). The 3- mile hike was easy with beautiful views of the mountains surrounding the fields. Rocky and I successfully climbed over a couple of stiles as we avoided cow patties along the way. There were no cows in the fields to sing to, but we heard their mooing off in the distance. Returning to the trailhead, Rocky and I walked (SOBO) toward Iron Mountain Shelter for a couple of miles. The forest was so much different than the open pasture – both so beautiful in their unique ways. We piled our packs and trekking poles in the car and headed down TN 91 to Damascus, Virginia. The half-hour drive was still back roads, but the curves were not as bad as yesterday and the seasickness pills were unnecessary. The trail town of Damascus is the site of Trail Days held every May which boasts as being the largest event of the AT with reunions, talent shows, music, and a hiker parade. Rocky and I gather a few Passport stamps including Dave’s Place, a hostel where I slept during my 2014 thru-hike. Before heading out for a hike north of the city, we stopped in a wonderful little shop called “It’s a God Thing, Too.” This thrift shop is the ministry of One Way Baptist Church in town. Rocky found a couple of purses, a pair of sandals, and some snazzy shorts, but the biggest reward of the shop was meeting Kim and Gail. These two sweet women were volunteers who love the Lord and have such an impactful ministry in this trail town. They shared about the light they share with the community and the thru-hikers throughout the year. They have a special ministry of hospitality during Trail Days. They invited us to return next year and help share the light. Rocky and I walked through the town and ended up hiking some of the Virginia Creeper Trail as it junctional with the AT. As we left the VA. Creeper Trail and headed north on the Appalachian Trail, it began to gently rain. The canopy kept us surprisingly dry, but the moisture created a tropical rainforest effect on the path. Our glasses began to fog up and the sweat began to roll. We climbed for a mile or two before turning around and retracing our steps back to Damascus. Driving 12 miles out of Damascus, we came to I-81, which was quite a change from the narrow, tight turns of the twisty country roads of yesterday. The drive up I-81 led us to the exit for Mount Rogers National Recreation Area. The AT crosses right in front of the Visitor Center. We stopped at the center to get a Passport stamp and then headed down the trail. In 0.2 miles we arrived at Partnership Shelter (one of the few shelters on the AT where you can order pizza delivery). At the shelter, we met a young man (and his dog) who was section hiking and about to get off the trail to celebrate his birthday. About a mile and a half down the trail it began to rain again. Rocky and I turned around and about halfway back we were surprised by a loud thunderclap. We noticed how much faster we walk when under pressure. Arriving safely back at the welcome center, we slid into our Old Faithful Toyota and made our way to Marion, Virginia. We stopped at a wonderful restaurant that Rocky found online called the Sisters Café and Gifts. Our waitress was so gracious and friendly. We enjoyed some delicious food and a piece of pie that was as far away from Whole-30 as you can get, but worth every calorie. They invited me to sign a wall in the restaurant devoted to thru-hikers. Rocky and I relaxed after a good day of hiking, laughed at all our inside jokes, and left the Sisters Café full and content. We have arrived at our hotel for the evening and look forward to Grayson Highlands and the wild ponies tomorrow. 5/ 10 It was raining on us after a few hours and the rocks got slick and the dirt got muddy. 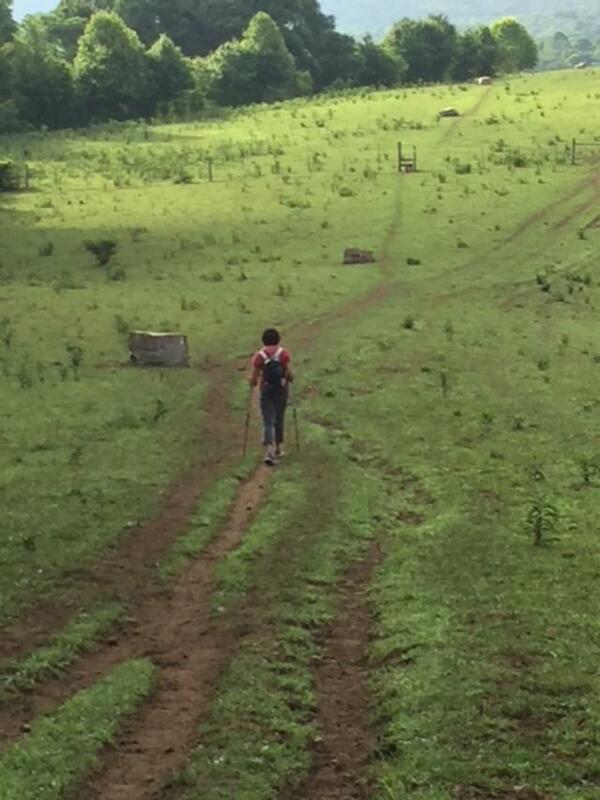 I lost the end of one of my trekking poles in the mud and it was lost and gone forever. With this terrain, functional trekking poles are a necessity…stop in Duncannon….so I could buy new poles. Since we [Hard Knocks, Roam, and Happy Feet] were there and wet, we decided to call it a day. We checked in at the Doyle Motel. If passing this way you should know that this is NOT the Hilton! 5/13 ‘Rocksylvania’ has truly earned its name among hikers. Lots of different rock challenges here. 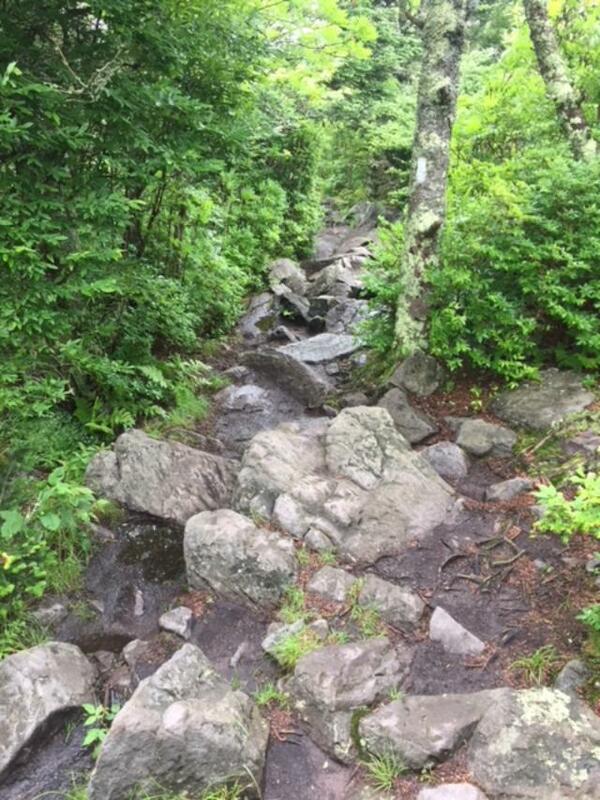 We have had mazes to go thru, boulders to climb over, and general walking hazards in uneven and unstable steps. 5/16 [After a zero-day in Port Cilton, PA] Just a quick object lesson I guess. In addition to staying hydrated you must provide plenty of fuel for the fire, and the calorie fire is huge when you are hiking the AT. So now I am off to burn more calories! 5/13 I have a shin splint on my other leg now. Went into Waynesboro and resupplied. Had wonderful people bring me to town and take me back to the trail head. Very much appreciated. 5/16 Started walking at 7:20. Walked in rain most of the day. It was a beautiful day in the forest. Climbed boulders in the morning and walked in mud and water in the afternoon. Had to set my tent up in a jungle. The trail is 6 inches wide and on both sides it is grown up with who knows what. 5/10 The day started nice enough through pasture lands and past the Keffer Oak. 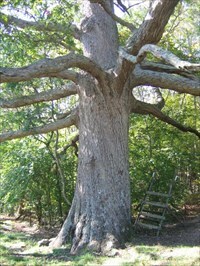 At 300 years old it’s “the 2nd largest oak tree along the AT”. Apparently there’s a bigger one in NY, I’ll let you know….I have just enough food to get to Daleville, three days away. There is a small store halfway where I’ll pick up some extra calories to be sure. 5/13 Sunday’s weather was hot. I heard some hikers say it had affected their mileage but I had no problem, maybe I’m not moving fast enough to get overheated. 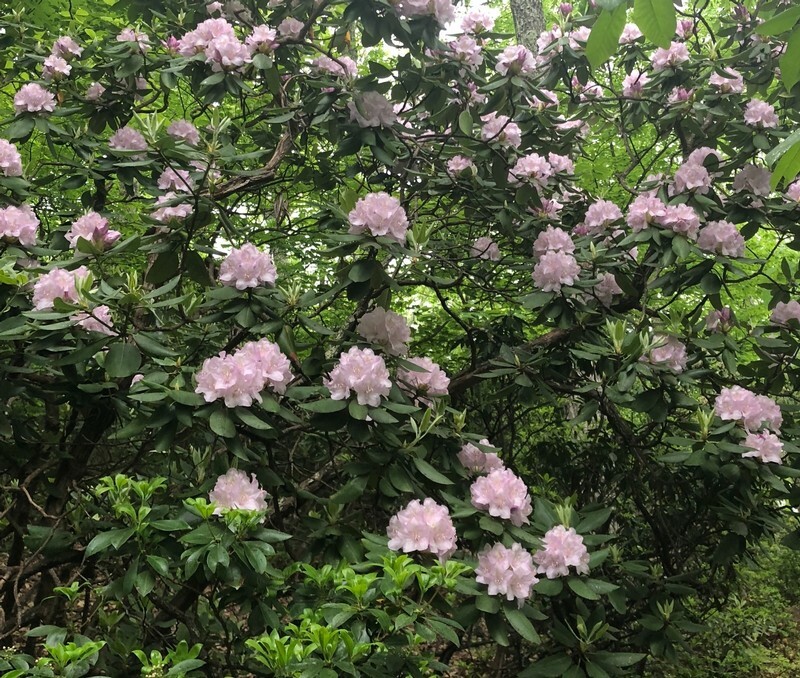 The Rhododendrons were blooming and the Mountain Laurels are getting ready. Late in the day I passed through a long tunnel of Honeysuckle bushes, sweet! Saw my first rattlesnake. The rattle end was two feet into the trail, the rest hidden in leaves. Hmmm…what to do. I spotted it easily but it wasn’t hard to imagine someone else coming along and stepping on it. I tossed a few sticks to move it along but that only prompted it to lift its head and look at me, flicking its tongue…unnerving. 5/10 [After a Zero-day in Daleville, VA.] It always seems to be a little more difficult to get going the day after a Zero…. Fortunately the first couple of miles were relatively flat. The trail here paralleled I-81, eventually crossing under the busy interstate, another open pasture, and finally we were back in the forest, where we belong. 5/13 Mother’s Day… our hike started at 0645, because Which Way wanted to get to town so that she would be available to talk to our kids when they called. I usually get flowers for Which Way on Mother’s Day…. As we departed camp I told her that all of the flowers on along the hike today were hers to enjoy for Mother’s Day. Of course, the trail did not disappoint. We had a single significant climb today and it came early in the hike…. At the top of the climb we paused for a break and to worship. It is so easy to count our blessings and give thanks out here. The wildlife was out and about this morning. We ran across a bunny hopping up the trail, two chipmunks playing chase, squirrels, birds and butterflies fluttering about, a deer just off the trail and two snakes. Some of the wildlife actually posed long enough for a pic. 5/16 We started hiking a little before 7AM with the intent of making it 17 miles to VA Route 56 by 3PM. We wanted to be off the trail on Thursday so that we could be in contact with our daughter who was having surgery.,,,, We emerged soaking wet from the forest at the VA 56 parking area at 2:45PM…. trail angels Dave and Jim…drove me to the Enterprise rental car agency located another mile or so away. We knew that at some point in the hike we would have to make a quick sprint to Washington, DC so that I could get a Retiree ID Card and we could pick up our 90-day refill of meds…. After shuttling a couple of hikers to a local AYCE Chinese Buffet, we hit the I-64, headed to DC. …We arrived at my cousin Bill’s place in Old Town Alexandria a little before 10pm. Bill had brownies and ice cream ready when we walked through the door. Death by chocolate—Perfect! 5/8 Wally and I broke the day – which we knew was a tall order: over 18 miles – into thirds. The first was a six mile stretch that included two, 2-mile climbs. By focused attention to a steady pace, we conquered the first third. The morning was brilliant weather but clouded up most of midday. The next six miles rolled through woodland without any views or points of interest except we were able to have lunch at Lewis Mountain campground. After climbing Bearfence Mountain, Wally waited for a ride at a Skyline Drive parking lot and I finished the last 6 miles by myself. The afternoon changed back to the brilliant sky with a cool breeze – wonderful conditions for the hike. The late afternoon light seemed to help illuminate the wildflowers. 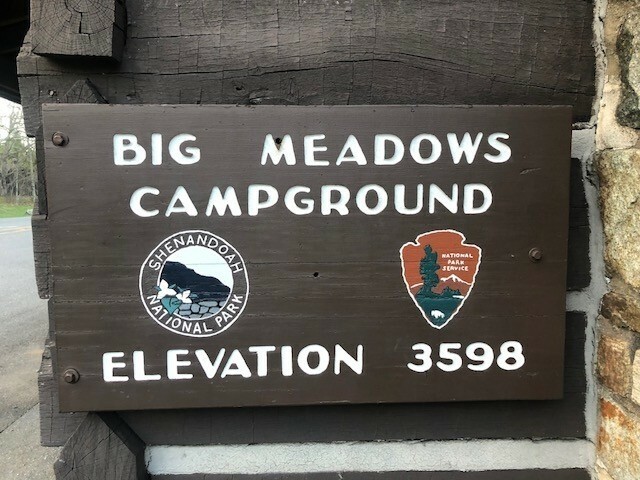 I made very good time on an excellent trail….tented at Big Meadows campground. 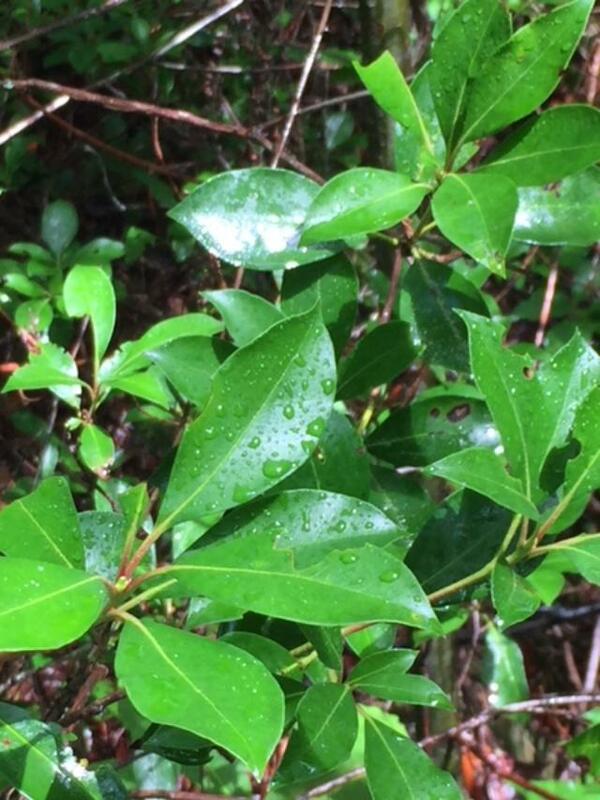 5/12 Today started rainy and the rain actually came intermittently most of the day. However, it never actually broke out into a hard rain, just enough to make me put my umbrella up and down several times in the morning in the afternoon. I was kind of dragging in the morning and came to about a 5-mile mark and at a shelter when the rain was threatening so I stopped and cooked a hot meal and made some coffee. A hot meal at lunch time is a rare thing but… the real pick me up. Rest of the day went quite well and I ended up doing 16 miles stopping at Low gap. A thunderstorm was raging to the north of me and threatening me so I put up my tent and let it pass with barely any effect, just enough to wet my tent. It caused a late dinner as I did not start cooking until close to 8 but I need the calories after 16 miles. Today’s hike had an interesting pastoral section where I walked through some actual pastures that connected to Mountain sections. The barn had a big AT symbol on it so the farmer is obviously a friend of the trail. And then there were seven… I began following 14 Appalachian Trail Thru-hikers that started their adventures in either January or February. I wanted to see how these early starters managed along the trail. In general, the rate of success for thru-hikers is about 25% – only one in four make it from the southern terminus of Springer Mountain, Georgia all the way to Mount Katahdin, Maine. The 14-state challenge of 2,190 miles is a test of endurance both physically and emotionally. At the end of the first week of May, 50% of the original hikers are off the trail while the other half are continuing to check off miles and days toward their goal. The weather has blossomed as well as the wildflowers. The forest is green as the foliage creates the green umbrella protecting the path and those who hike it from the blazing sun. The challenge of the winter is drawing to a close and the trail is free of snow and ice. Let me provide a quick update on the seven remaining hikers and their progress on the AT. Patrick Knox, trail name Hard Knocks, is the only January starter still on the trail. He has made it over halfway and is resting at Darlington Shelter, 14 miles north of Boiling Springs, Pennsylvania, at mile marker 1,131.8. Boiling Springs is such a beautiful small town that embraces the smelly hiker with hospitality. It was one of my favorite trail towns in 2014. Bamadog stayed at the Mountain Home Cabbin (hostel) in Front Royal, Virginia, on May 8th and then hiked 21.7 miles on the 9th to a stealth campsite. He is about to reach the 1000-mile point but must experience The Roller Coaster (13.5 miles of tightly packed ascents and descents) to get there. 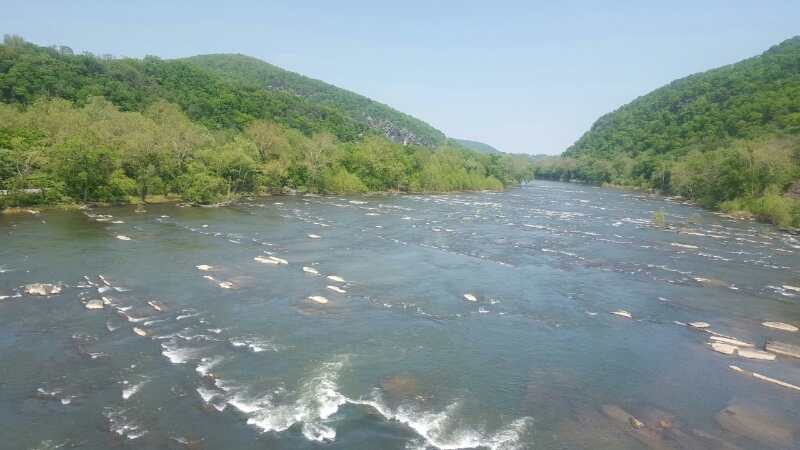 After the Roller Coaster, there are only 19 miles to Harpers Ferry and the Appalachian Trail Conservancy – a major milestone in the thru-hike adventure. At the Conservancy, hikers get their pictures taken, their names recorded in the official list of hikers, and a number indicating their order of appearance among the class of 2018. Chip Tillson arrived at Pearisburg, Virginia, on the 6th of May. 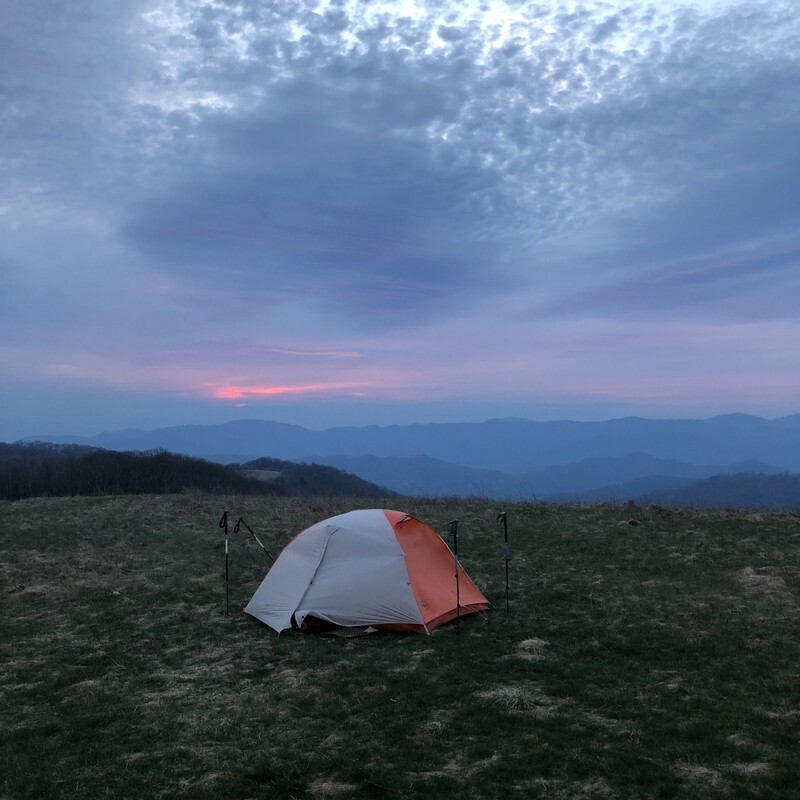 During the next two days, he hiked 23 miles and finally camped near Bailey Gap Shelter (mile-marker 654.5) on May 8th (the date of his last journal post). 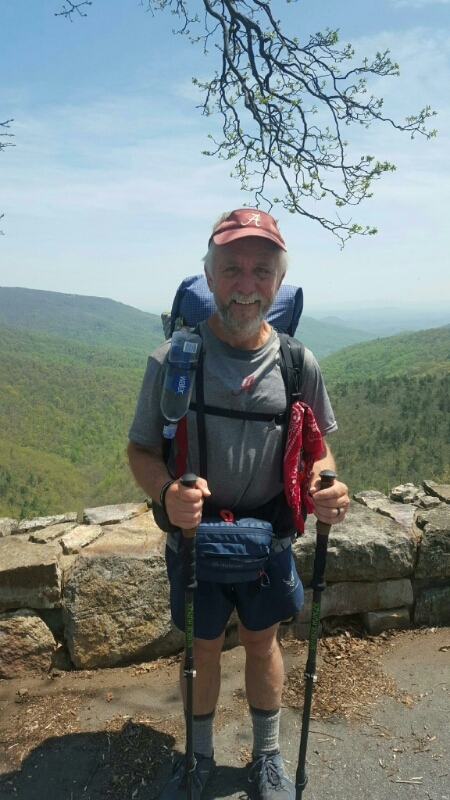 He is hoping to hike another 70 miles into Daleville, Virginia, before taking another day off. Sour Kraut posts pictures occasionally so I know he is still on the trail. However, he does not journal with words so I am never sure exactly where he is. 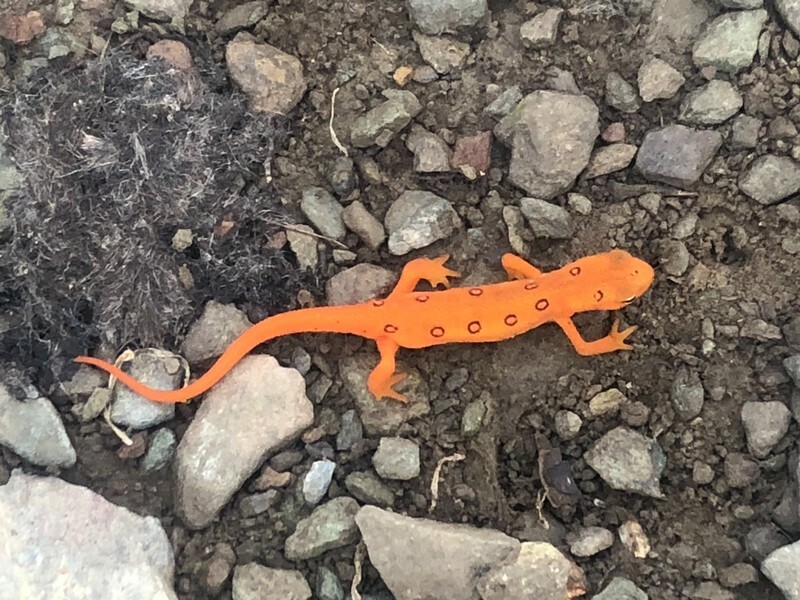 The last photo was dated May 6th, but is was of an orange salamander. His last landmark photo was the Guillotine on April 30. 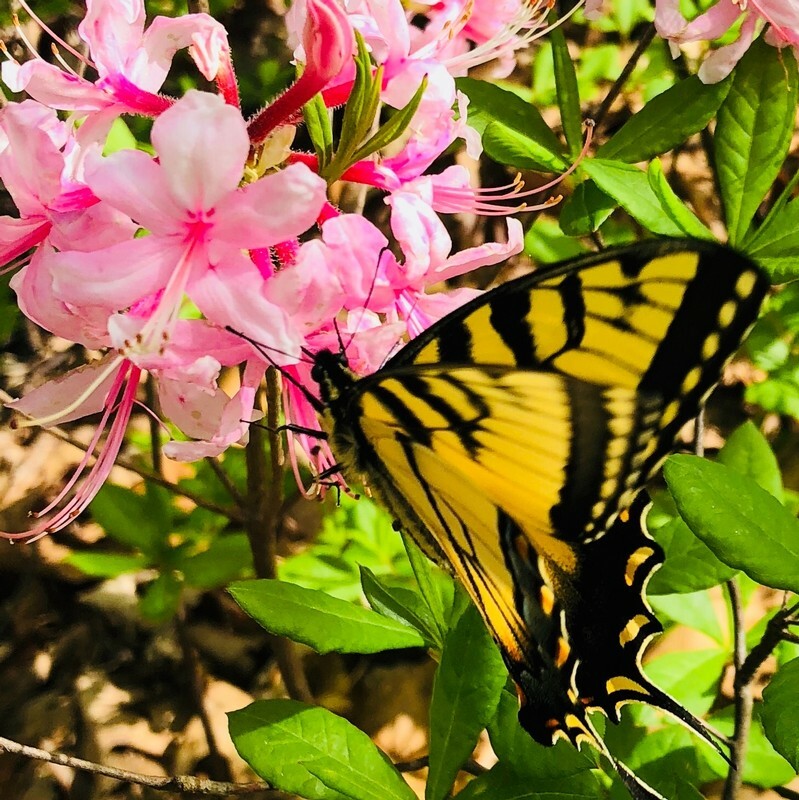 I am guessing that he has made it into Shenandoah National Park around 860 miles north of Springer Mountain, GA.
My concern for this wonderful couple is their time constraint. They have great attitudes and seem to be enjoying the adventure with marvelous gusto. But Labor Day is September 3, 2108. They still have time, but they will need to really pick up the pace. At their current rate of 9.65 miles per day, according to my quick calculations, they will be 327 miles short of Mount Katahdin on September 3. It would take them another 34 days to reach their goal. However, they would only need to up their average distance to 12.4 miles per day to reach the brown sign in Maine. RTK, Bruce Matson, like Which Way and Next Step has arrived at Daleville, Virginia. However, RTK posts in his journal a week late. So he arrived in Daleville on April 29th. He experienced a great week on the trail with friends and family joining him for some of the adventures. He has walked by Keefer Oak (the second largest oak tree on the AT – over 300 years old and 18 feet around), the Audie Murphy Monument (the most decorated American soldier of World War 2), Dragon’s Tooth (a huge stone monolith), and of course McAfee Knob (one of the most photographed spots on the trail). He also enjoyed a great all-you-can-eat meal at Homeplace Restaurant. (This hiker favorite in only open Thursday through Sunday. I sadly hiked by on a Wednesday in 2014). A great b-day so far. I woke on top of Hump Mnt and watched the sunrise out my tent doors. 360 degree view from there had awesome sunset sunrise and stars. I slept half out of my tent to enjoy the stars until the wind whipped up and I scooted into the tent. The wind gave my tent a workout… I then Nero ed into Roan TN and stumbled into station 19 hostel. They have… a pig roast tonight with live music. A real bed shower laundry and shuttle to town. I may zero tomorrow with rain in the forecast…” This was Pigweed’s most recent post. He has been silent for the five days so I am anticipating an up-date very soon. Roan, Tennessee, is at the 392 mile-marker. Pigweed had many, many more miles to travel on his adventure. Vagabond Jack, Jack Masters, is from Kansas City, Missouri, although his home for the year prior to his thru-hike was his camper truck. 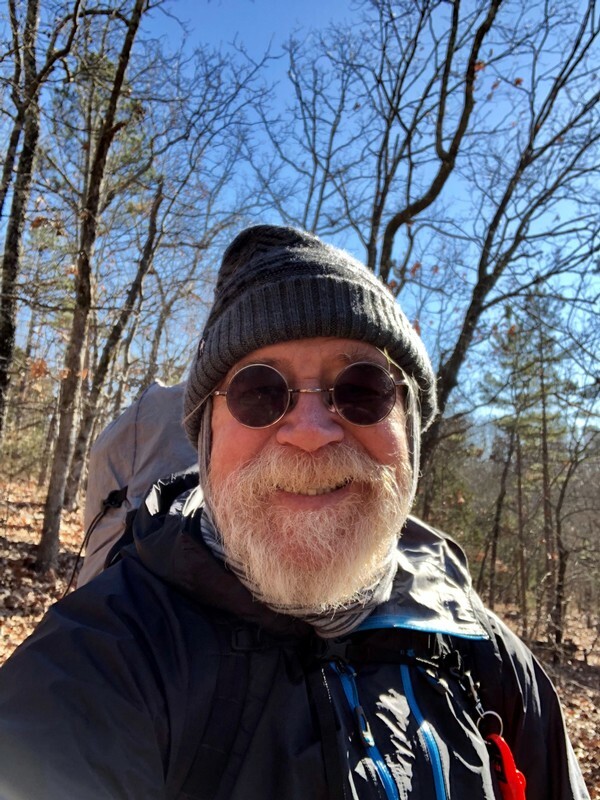 Jack is a 66-year-old retired database engineer who began his adventure on the Appalachian Trail on February 1, 2018. Last year (2017) was a difficult one for him. After his wife died after a 5-year battle with illness, he sold his house, purchased a camper, and traveled around the US. He drove his truck to Georgia on the last day of January, put his vehicle in storage in Marietta, grabbed a shuttle to Springer Mountain, and began his trek the next day. Eighty-eight days later his thru-hike has ended. He walked 677 miles, lost three toenails, fell 13 times, and dropped 16 pounds. He only had one small blister but went through 3 pairs of shoes. Vagabond Jack’s hike on April 29 was a brisk but sunny one. He encountered a couple of tricky stream crossings but navigated without a fall and kept his feet relatively dry. Once across the water, he found an easy walk through the woods. Two miles into his walk he came to a pasture and then to Virginia Route 42 leading to Newport and Blacksburg (his last chance for an easy access to a town for two or three days). He decided he needed to go into town and seek some medical advice. Sometimes it is not the distance or the number of days on the trail that changes a person’s perspective on life, but the quality of experience makes the difference. I trust and pray that Vagabond Jack found some peace and inspiration and contentment was he spent 88 days in the glory and beauty of God’s creation. I enjoyed hiking with him in a virtual way through four of the fourteen states that make up the Appalachian Trail. 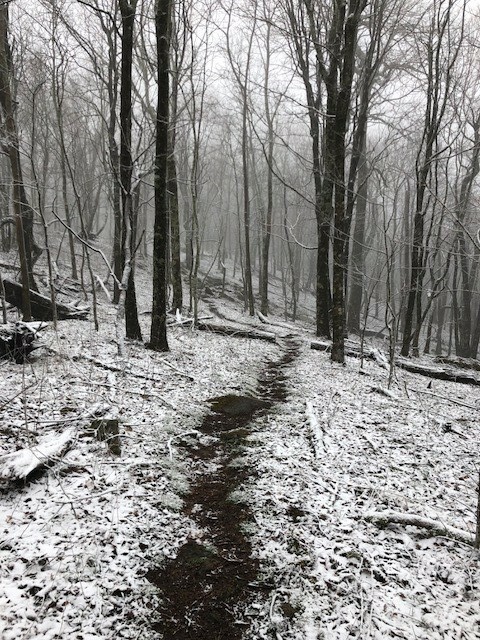 April 2018 was a cold month with some snow, ice, and slippery trails for those attempting a thru-hike of the Appalachian Trail. It has only been in the last week of April that the temperatures have been comfortable and the conditions reflect the change of seasons. The last week of April find my nine hikers (those brave souls that I have been following on trailjournals.com) spread out over almost 1000 miles of the trail. All of them began their journeys between January 31 and February 27 and all of them have been diligent in their goal of conquering this iconic long-trail covering 2,190 miles through 14 states from Georgia to Maine. Let me give you a quick update on each hiker in order of their start dates. Hard Knocks, Patrick Knox, started on January 31. As of his last post (4/30/2018) he has been hiking for 90 days and has covered 1,010 miles. He is camped at Stonybrook Organic Farm and Hostel, a religious commune run by the Twelve Tribes Network. 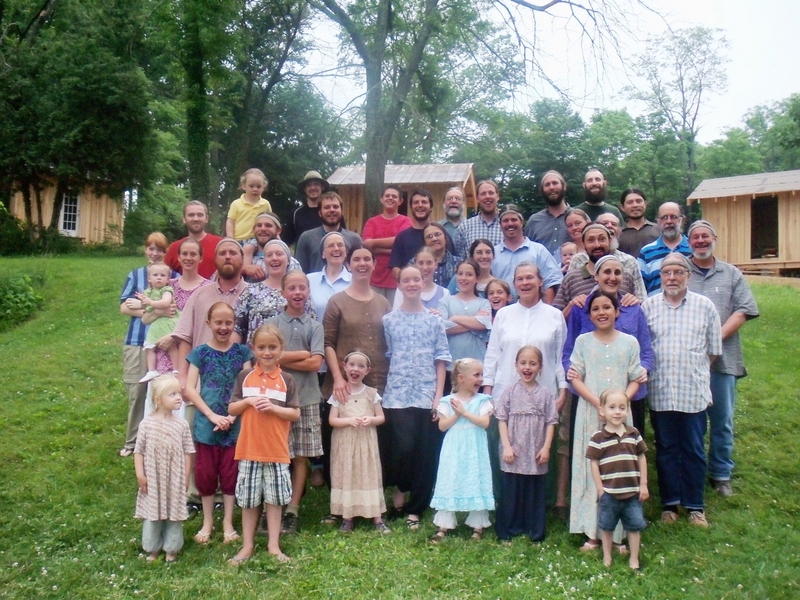 Hard Knox shares, “…it is a religiously based commune. It is a beautiful place and all of the people seem very nice all for the low price of Zero Dollars. All they ask is that you work a little (I mopped a floor tonight) or consider a donation before you leave. It is certainly nice enough for me to consider a zero-day tomorrow before I make the hike to Harpers Ferry. If so, I will give more of a report on the hostel/commune. So, maybe arrest day tomorrow before I continue walking.” Hard Knocks is averaging 11.2 miles per day and at this rate, it will take him 196 days to complete the trail. Vagabond Jack, Jack Masters, began his hike on February 1st. 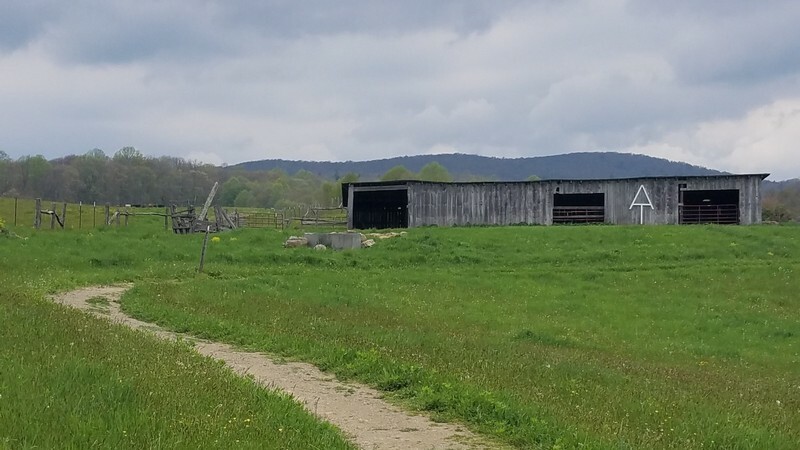 His last post was made on April 28th and Vagabond was about 40 trail-miles north of Pearisburg, Virginia, at Laurel Creek Shelter and 670 miles from Springer Mountain Georgia. Jack is only averaging 7.7 miles per day, although he walked 16.5 miles on April 27th and 14.6 miles on April 28th. 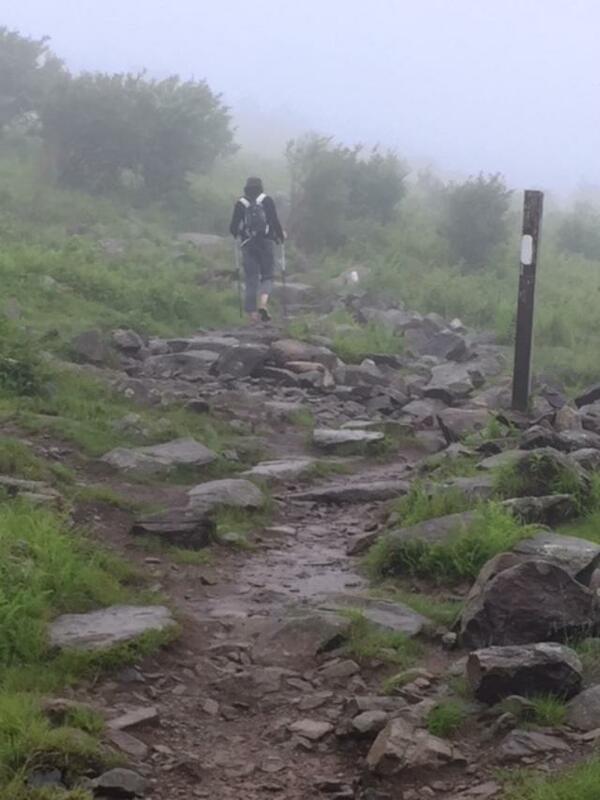 At the overall rate of 7.7 miles per day, it will take Vagabond Jack 285 day to complete the Appalachian Trail. Opa is Reinhard Gsellmeier from Rochester, NY. He began his thru-hike on February 10th but has covered more miles than any hiker in this group. On April 27th he was at the 1,275-mile mark and experiencing the rocks of Pennsylvania. He met family in Wind Gap, PA, and drove home to Rochester for a few days of relaxing. 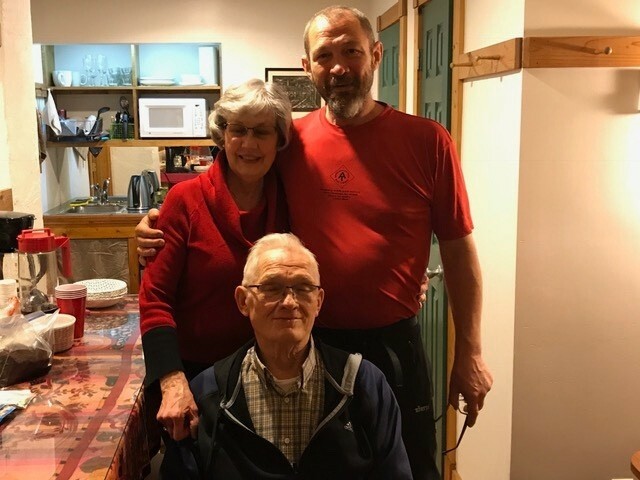 After a day of resupply, Opa took ill and found himself in a New York hospital.He shared on April 30th, “I basically have an enlarged prostate, a condition that is not uncommon for men my age. I will also be scheduled to see an urologist, who will further evaluate my condition and advise as to treatment options. 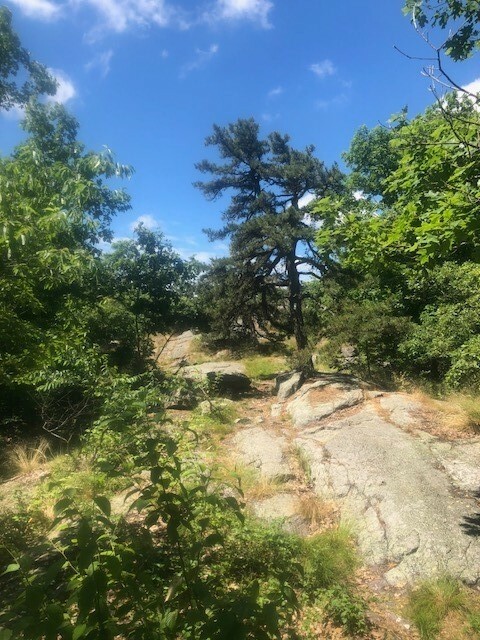 My doctor also re-examined my hernia, which I’ve had since last fall, and he advised that my hernia now needs to be surgically repaired once my prostate issue is resolved and before I have any notion of continuing on with my AT hike…. These health issues are nothing serious that can’t be dealt with, but it looks like the continuance of my AT thru hike attempt is going to be put on hold for awhile… In one respect I consider myself very fortunate that the issue with my prostate manifested itself while I happened to be in Rochester for the weekend….This will be my last journal entry for at least awhile.” I will keep you posted on Opa when he updates his journal. Bamadog, Marty Dockins, took his first step on the AT on February 15th. He is averaging 11.1 miles per day and at this current rate, his trip to Mount Katahdin will take 197 days. 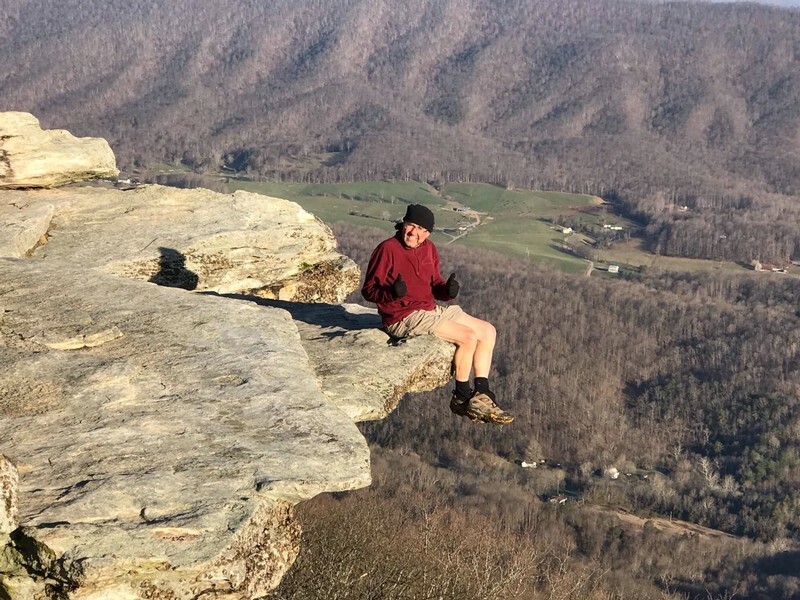 He has just crossed over the suspension bridge at Tye River, climbed about 3000 feet to Three Ridges Mountain, and is about 25 trail-miles from Waynesboro, Virginia. 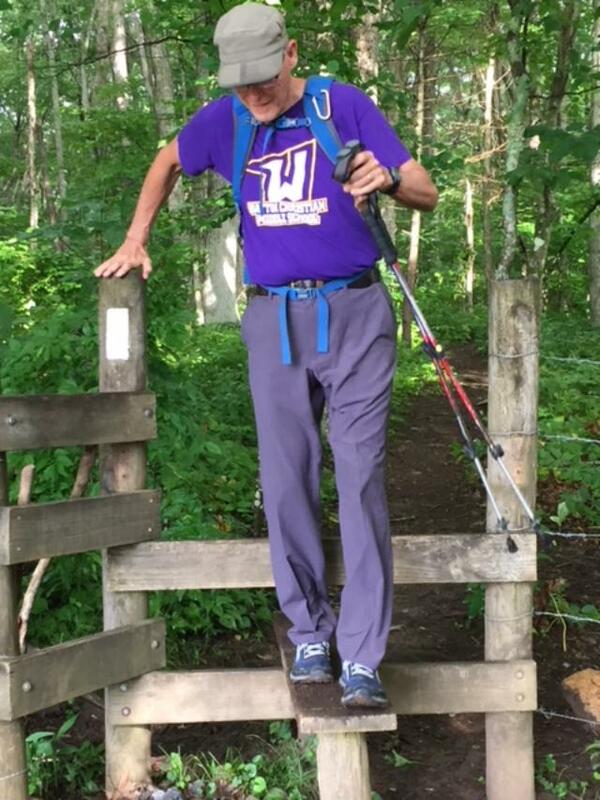 Chip Tillson started his hike on February 20, seventy days before his last post on April 30. He is camped close to Walker Gap about half way between Atkins and Bland, Virginia. 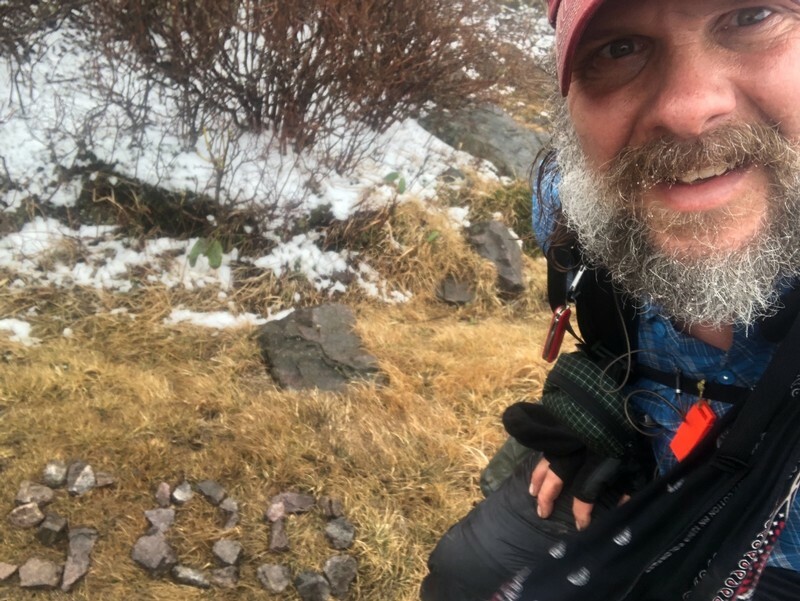 He is only averaging 8.1 miles per day with an estimated total of 271 days needed to complete his thru-hike. Hopefully, the spring weather will enable him to increase his daily mileage. Tim Pfeiffer, Sour Kraut, took to the trail on February 21. He has not posted a written journal entry since March 11, but he submits photos to mark his progress. 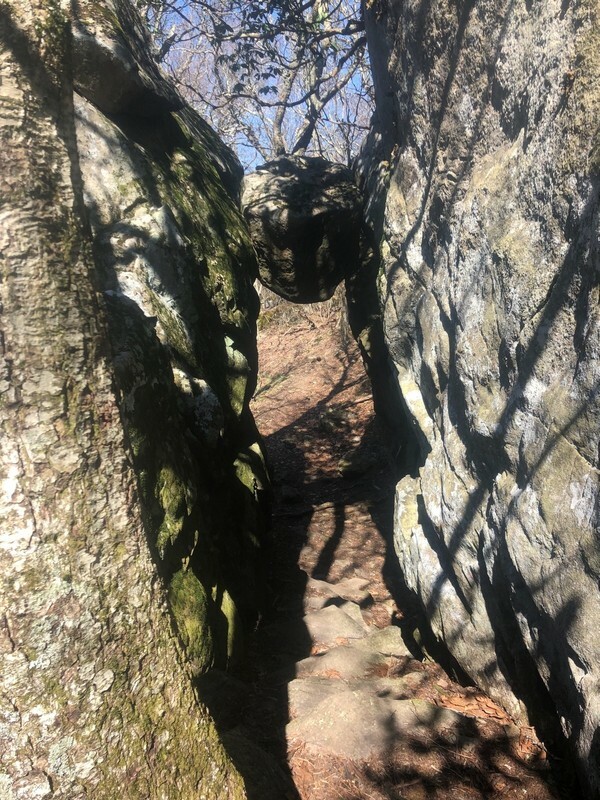 He posted a picture on April 30 (day 69 of his trek) of The Guillotine, a round rock balanced on rock-outcropping, under which the path leads the hiker. It reminds me of the Indiana Jones movie where Indy has to run away from the rock rolling over his head. The Guillotine is 765 miles into the hike. Sour Kraut is averaging 11.4 miles and at this rate will need 197 days to fulfill the dream. 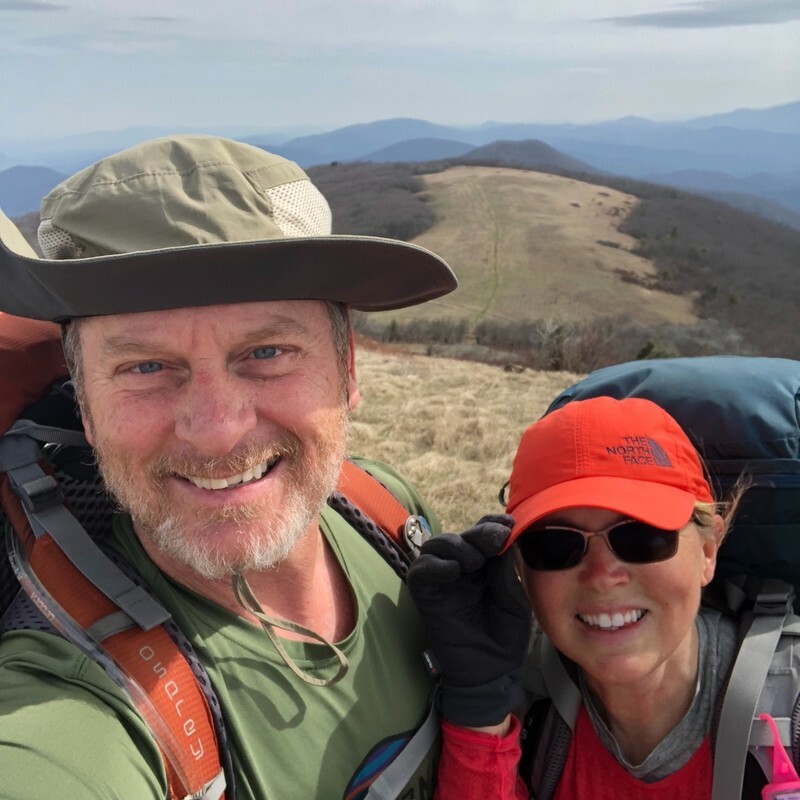 Which Way and Next Step, the couple from Washington, DC, crossed the 600-mile marker after spending 65 days on the trail. The couple is about two or three days away from Pearisburg, Virginia. They left on February 25 and, so far, are averaging 9.2 miles per day. At this pace, their thru-hike will take 238 days. However, they are making much better mileage in recent days and the weather should help their pace as well. RTK, Bruce Matson, records his journal a week late so it is difficult to compare his trek with the others. However, on day 58 of his hike (April 23), which began on February 25, he is about 663 miles into his northbound (NOBO) adventure. His pace is 11.4 miles per day with an estimated trip of 192 days. Spring makes such a difference! Pigweed started his hike on February 27, had to take two weeks off for an injury, and is now back on the trail. He is several hundred miles behind the others who started in February and is only averaging 5.5 miles per day. He is in Erwin, Tennessee and has hiked about 341 miles. This rate will make his trek last more than a year (398 days). During the past six days, he has increased his mileage to 11.5 miles per day. I think to be successful he will need to continue to increase his daily distance if he hopes to complete this challenge. My hopes and prayers for these thru-hikers is that the good weather ahead will encourage and refresh them. Their legs should be strong and now, more than ever, the emotional aspects of the trail are critical. Injury is only a fall away, sickness can strike any day, and discouragement can creep up on a hiker without too much warning. But, the warmth and color of spring can propel the hiker with zeal and excitement. May the winds of May fill their lungs, hearts, and minds with strength and a renewed commitment to the journey. 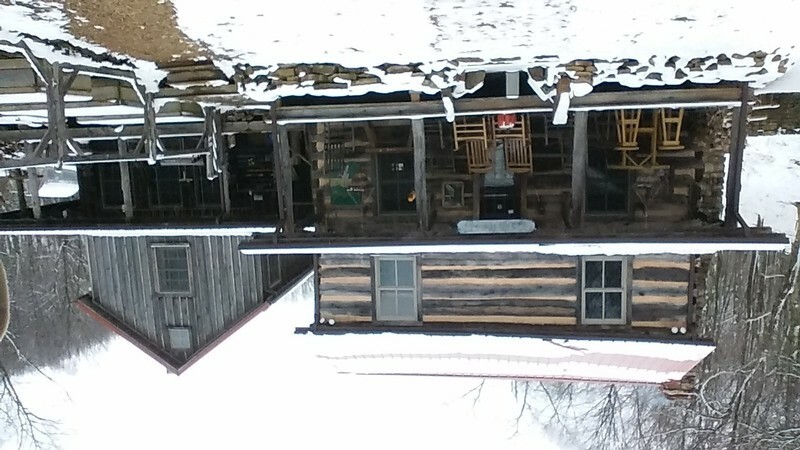 Photo of Commune from https://www.twelvetribes.com/community/stoneybrook-farm-dc-area. All other photos taken from trailjournals.com. 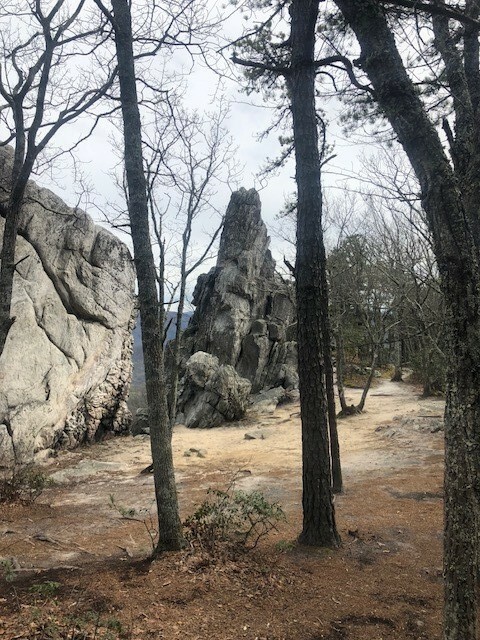 As a follow-up to yesterday’s post, I wanted to provide a progress report on the other five hikers that I have been tracking as they attempt a thru-hike of the Appalachian Trail. Chip began his AT adventure on February 20, 2018. As of April 9th, he has trekked over 350 miles. He is through the Great Smoky Mountains National Park, passed Hot Springs, North Carolina, and ten miles beyond Erwin, Tennessee. Having to take several days to heal from a fall on his shoulder, Which Way and Next Step have caught up with Chip. He mentions meeting them and seeing them several times during the past few days. Chip developed his first blister during his hike into Erwin, TN, so he decided to take a zero-day at Uncle Johnny’s Hostel for some TLC before moving on. Tim Pfeiffer, who started on February 21st. His photo journal makes it difficult to track his mileage but his last photos show him at hiker-made the 500-mile marker. That puts him in Virginia just north of Grayson Highlands. Return To Katahdin (RTK), Bruce Matson is reporting his adventure in posts summarizing each week. He posts a week behind his current location so his last post reflects his journey through April 3. His strong hike has only included two zero-days in the past sixteen hiking days. He stopped at Hot Springs on the 23rd of March and then again on Easter Sunday in Roan Mountain, Tennessee. He stayed at the Roan Mountain B&B which brought back memories for me, as I enjoyed a day there as well in 2014. 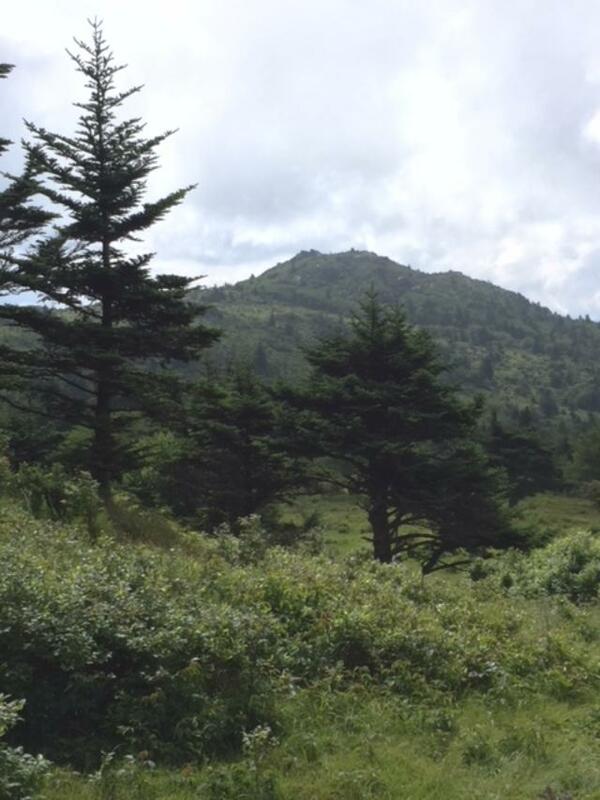 His last post finds him camped at mile marker 413.2 at Moreland Gap Shelter about 20 miles north of Roan Mountain. Here is a quick summary of the progress of each nine thru-hikers that I am following. I have been on vacation down in North Carolina and West Virginia over the past 10 days, but the nine Appalachian thru-hikers that I am following have been facing some snowy, cold, rainy, windy days. In order to catch you up on their progress and not write a book, I am going to share about four hikers today and the other five tomorrow. 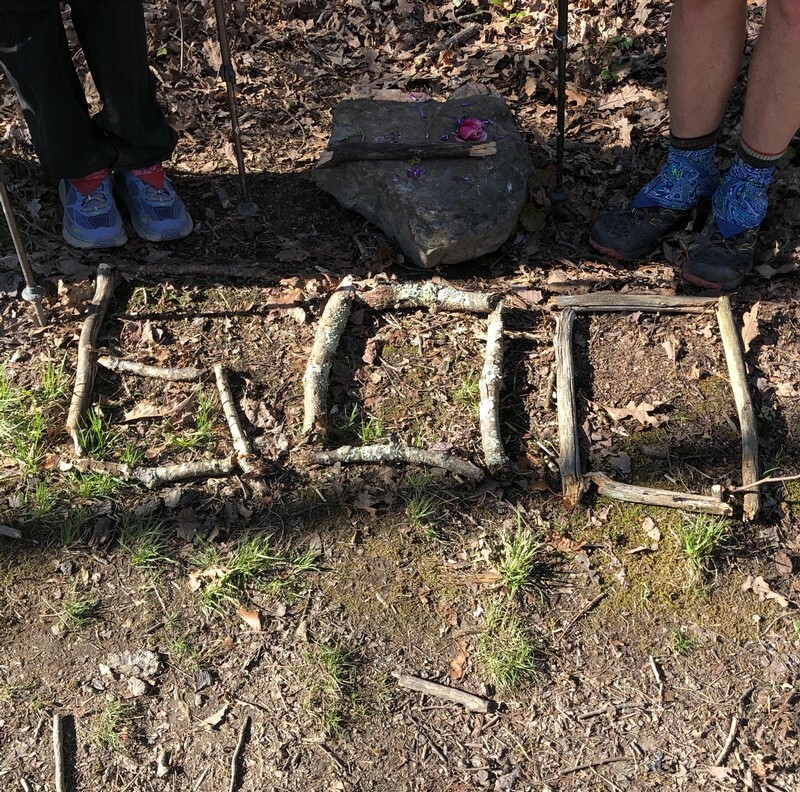 The incredible weather of this stubborn spring has made the trail even more challenging as they attempt their 14-state walk. Hard Knocks, Patrick Knox Hard Knocks, started on January 31. He just updated his journal that had been spotty since my last update. He did not make a posting from March 22 until March 29. The best that I can tell, he hunkered down at a hostel to avoid the trail storms. He was back on the trail on 3/29 and commented that the trail seemed like a fast-moving creek due to the rain and melted snow. On April 3rd he began having difficulties with his ankle and ended up coming off the trail for three days. He has a niece in Roanoke who picked him up and offered her home for some recovery time. He got a new pair of shoes and replaced his backpack. 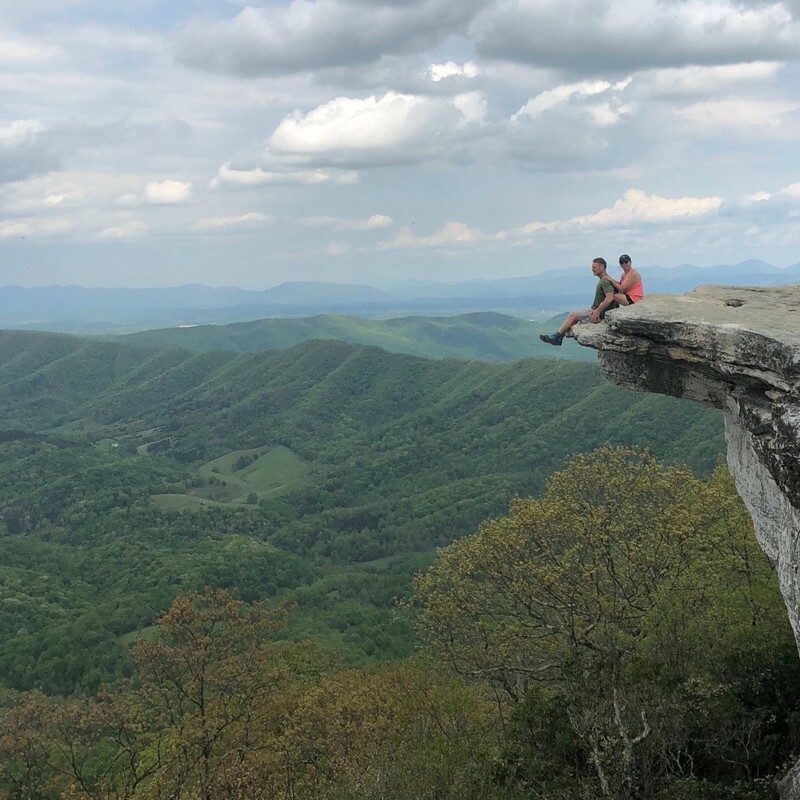 On April 8th he was back on the trail, passed McAfee Knob and Tinker Cliffs, and ended his ten-mile hike a Lamberts Meadows Shelter. 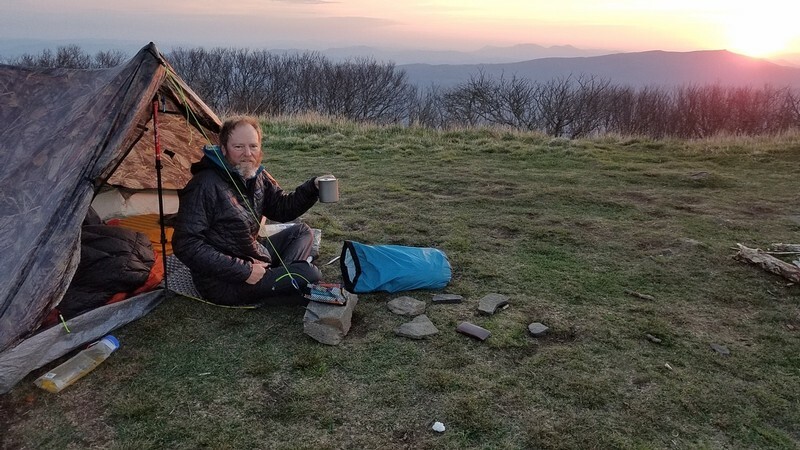 The next day he trekked fifteen miles to Fulhardt Knob Shelter and mile 729 of the Appalachian Trail. He reports that his ankle and new boots are working well as he eases back into longer hikes. 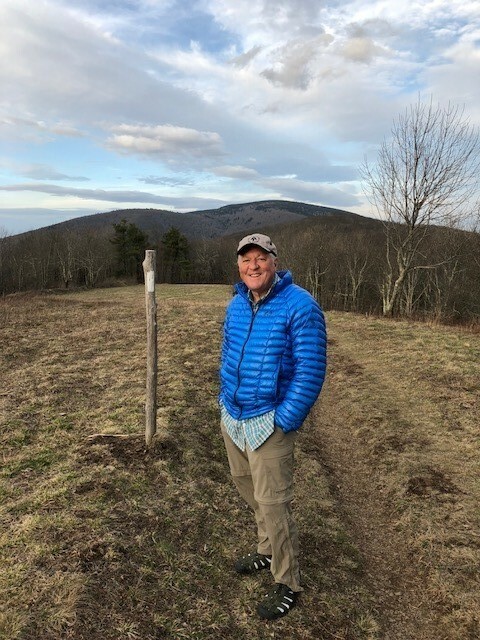 Jack Masters, from Kansas City, took his first steps on the famous Appalachian Trail on February 1. Vagabond Jack is consistently moving north. In the past 16 days, he has only taken on zero-day in Roan, Tennessee. On days that he hikes, he is averaging 10.4 miles per day. 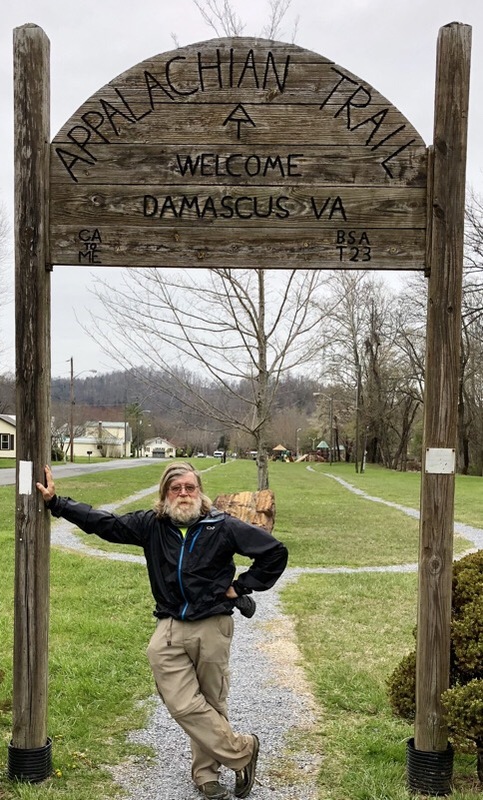 On April 9th, he arrived at Damascus, Virginia where he plans to zero on the 10th having hiked 468 miles of the AT. In his blog, he mentions that he has met RTK (Bruce Matson) on March 30 and then again on April 5th. They both know Mighty Blue and have been interviewed on Blue’s podcast so they had an enjoyable conversation sharing their adventures thus far. Vagabond Jack, like the other hikers this spring, faced many cold, rain, snowy, windy days. He mentioned the difficult weather on 11 of the past 18 days. His strategy through these challenging conditions has been to gain cover as much as possible. He has only spent the night in his tent three times; he has sought the warmth of a shelter on seven nights; and he has found the comfort of a motel/hostel on eight occasions. His plan seems to be working for him as he stays warmer and well fed along the way. 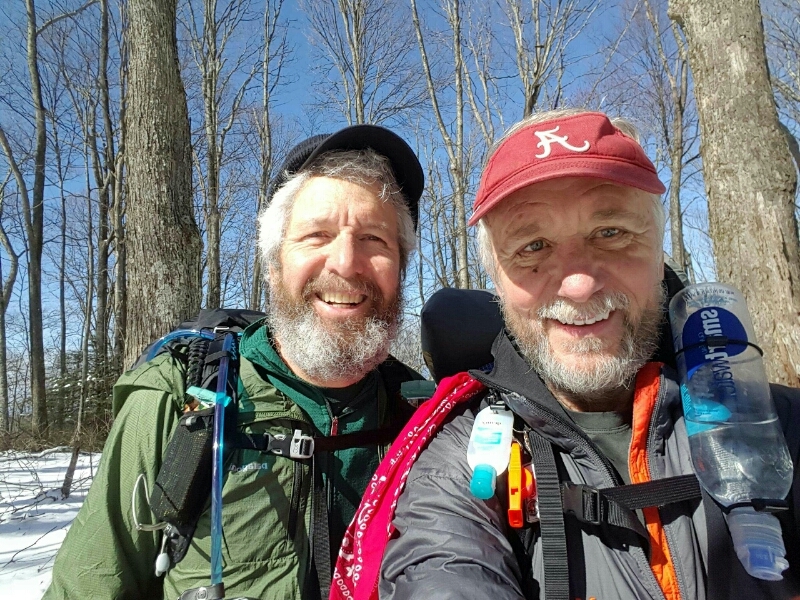 Opa (Reinhard Gsellmeier), the retired engineer from Rochester, NY, began his thru-hike on February 10. 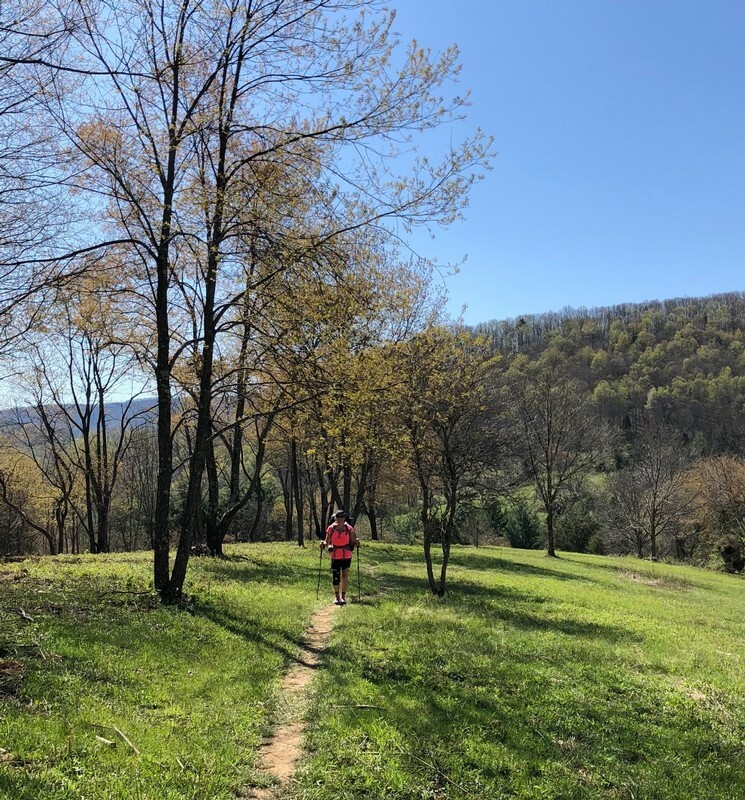 Opa is well over 450 miles ahead of Vagabond Jack and has passed Rockfish Gap near Waynesboro, Virginia, trekked 44 miles into Shenandoah National Park and passed the 900- mile marker on the trail. (There are very few actual markers, but guidebooks provide fairly accurate mileage.) But his walk has not been easy. On April 6th, Opa fell four times. He recounts his adversity in his blog, “I fell four times today, one of them hard. Nothing broken, but I have several aches and pains: my forehead, right hand, left elbow and left knee all ache pretty good as I lay in my tent tonite. My left knee in particular is pretty sore, cut up and a bit swollen. I must have fallen on a rock pretty hard with the knee, as it put a tear in my rainpants – which have a pretty durable fabric…. The funny thing is, I didn’t fall in any of the steeper sections of trail – it was always on a gradual slope. Go figure!” Opa is still hiking in snow and freezing temperatures with water bottles turning into slushies and temperatures in the 20’s overnight. Marty Dockins hit the trail on February 15th. His last post in his online journal was April 3rd. He was camped at the Abington Gap Shelter just 6.5 miles from the Tennessee/Virginia border and 11.3 miles from Damascus. He had put in his first 20-mile day and was looking forward to celebrating his 61st birthday in Damascus on the 4th. Bamadog took a week off the trail from March 24-30 to spend some time with his “sweetie,” avoid the weather and rest his tired body. He shares about the hiatus in his journal, I took 7 days off and went home with my sweetheart. Went to the doctor and got my leg checked out. He said my hip belt was pushing in on a nerve that comes out from the front of my hip going to my leg. I adjusted my pack so I am good to go! The first two days back my leg is feeling much better. I did 16 miles yesterday and 14 today. Just climbed 1700 feet to get to this campsite.” It sounds like his time off the trail was refreshing and just what he needed to continue his adventure. I am anticipating an update very soon from Bamadog.